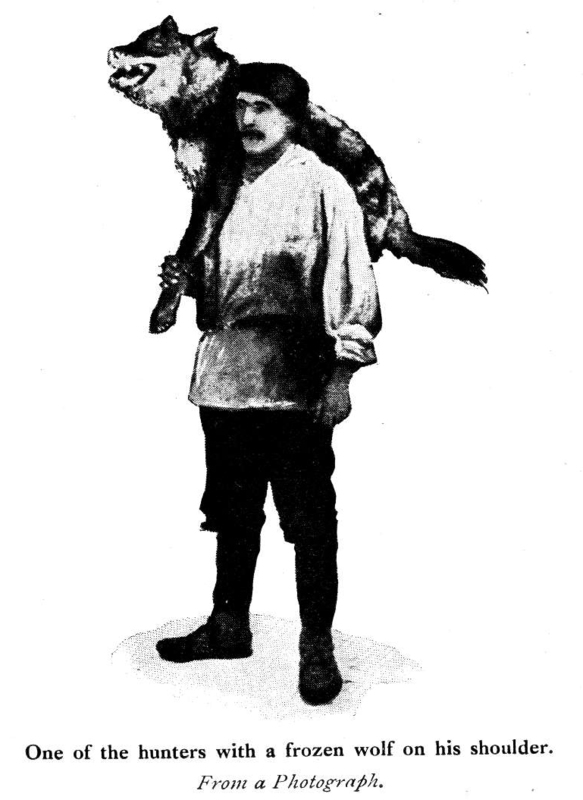 From The Wide World Magazine June 1911, Vol. xxvii.—17. 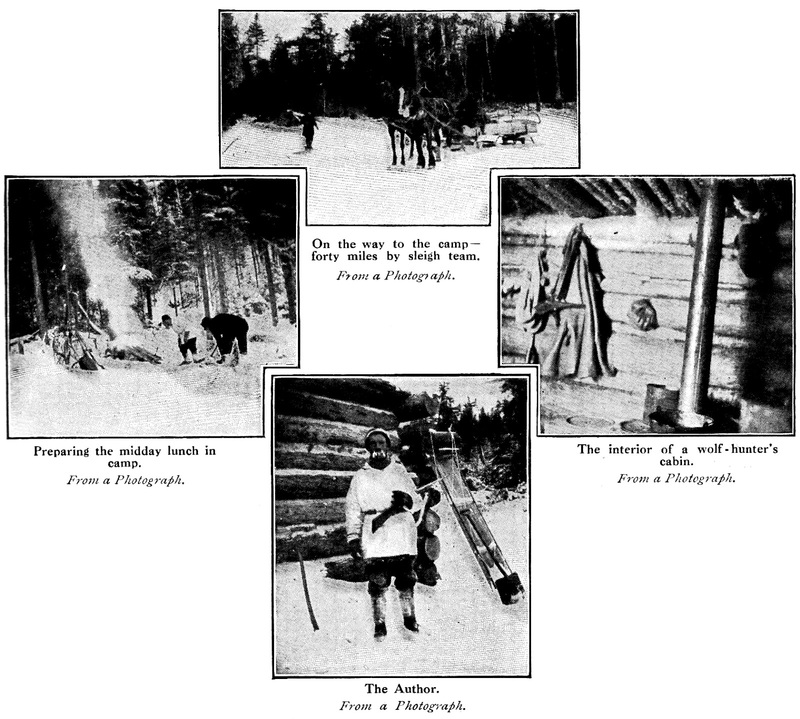 A rousing account of sport with rifle and snow-shoe in the great forests of Canada. In the school of wood-craft and cunning, says the author— himself a veteran hunter—the wolf has no four-footed equal. 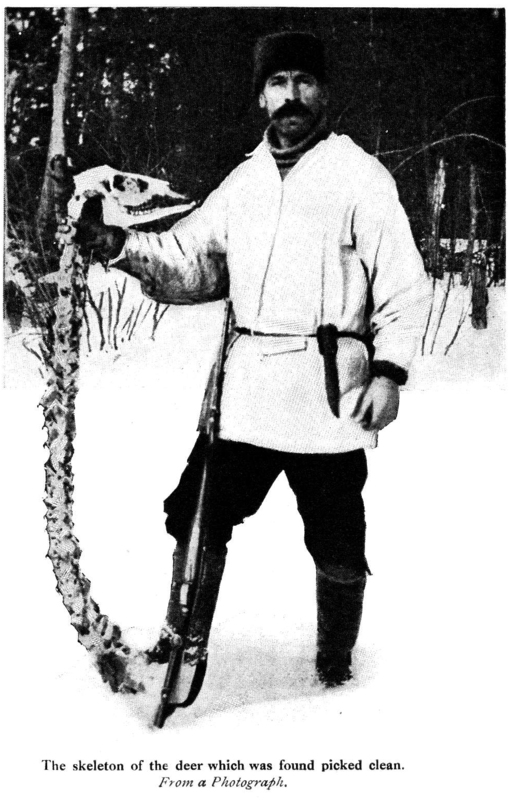 Mr. Hope describes the happenings of a three months’ hunt in the winter of 1908-9. Certainly not here in North America. Hunting wolves from horseback behind a pack of nondescript dogs is, of course, not a new sport on our vast, level prairies of the West. But in the still vaster forested regions of Northern Quebec and Ontario wolf-hunting as a sport is in its infancy; and here horse and hound must give place to rifle and snow-shoe in a rough, rugged country, intersected like a chequer-board by innumerable lakes, rivers, and streams, covered with from two to three feet of snow, and with the thermometer anywhere from ten to thirty degrees below zero. 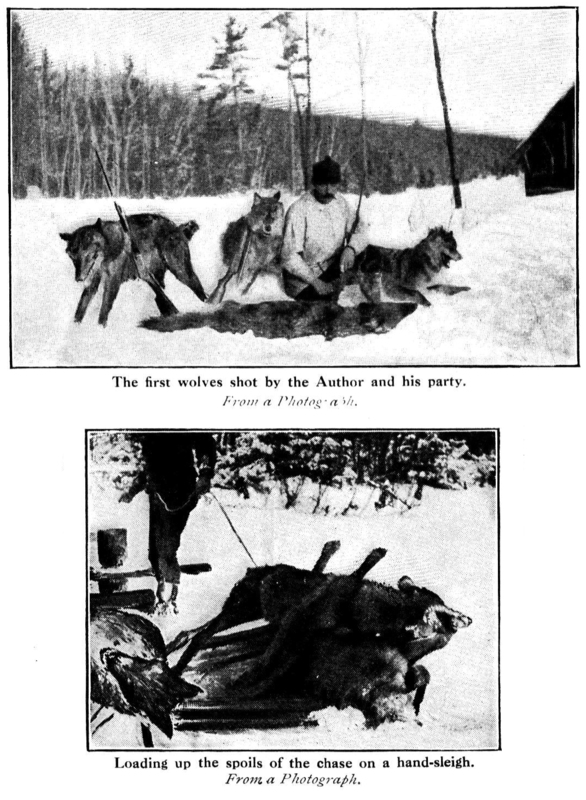 Therefore plenty of stamina and endurance is required to face these conditions, with a keen interest in the sport—more especially as wolves in numbers must be sought for well back in the deep, silent forests, miles from the nearest railroad or settlement. Men with these qualifications are not numerous. By many people wolf-hunting is considered a science. At the end of twenty-seven years hunting of various kinds of big game, including the wolf, in different countries, I have no reason to dispute this statement. It matters not what method one employs to hunt wolves in a forested or mountainous country, stratagem and cunning must be freely used to outwit cunning—combined as it is with faultless wood-craft and extreme cowardice—when trying to get them within range of the sportsman’s rifle. Only those who make a close study of wolves and their habits throughout the year can hope for success. All the men in Canada who do this, however, can be counted on the fingers of one hand. In the school of wood-craft and knowledge of how to keep out of danger wolves have no four-footed equals. The fox is a dunce in comparison, the coyote—or prairie wolf—a fool, and the rest nowhere. The giant moose, king of the Canadian woods, is the most difficult of all the deer species to stalk in the fall months; but, nevertheless, it is often stalked successfully and shot by amateurs. Not so the wolf. Knowing this, and that true sport must combine a maximum of exertion and even danger to a minimum of destruction (though nothing would be said about the destruction of too many wolves), also that there was more honour to be gained in outwitting and shooting one wolf than a dozen easily-stalked and innocent deer, the writer organized a wolf-hunt for the winter of 1908-9, built three log-cabins some miles apart, and invited sportsmen to participate. During the three midwinter months they came into camp in twos and threes for a week or ten days’ hunt. To all of them the sport was new, healthful, and exciting, not to say dangerous, considering the quarry sought and the risk of breaking through thin ice on lakes and rivers in its pursuit. As soon as the first hunters arrived—in December—we shot several wood-hares and ruffed-grouse. These we placed at rocky points round the large lake, infested with wolves, on which the cabins fronted. A couple of nights later half a score of wolves—judging by the way fur and feathers, legs and wings, heads and tails, were scattered over a wide area of the snow-covered ice, punctuated in between with thousands of their footmarks—must have had a glorious scrimmage over these dainties; yet not a particle of either grouse or hares had been eaten! This was subsequently repeated on several occasions, which goes to disprove the hitherto accepted statement that “wolves are always hungry”—at least, they are not here in Canada. Some three days later, while coming down the lake at midday from No. 3 camp, a ringing chorus of “yi-ki-hies” burst on our ears; from among the timber-covered ridges some half a mile away on our left. It came from a pack of wolves in full cry after a deer. The writer, an old fox-hunter, could distinguish no difference between these wild hounds giving tongue under the arches of a virgin forest far from civilization, and the civilized foxhounds of his youth making merry music in the British Isles. Presently they gave tongue only intermittently; then the sounds ceased altogether. They had killed, we decided, and so continued on our way, which was in the same direction, as the pack were running. We were mistaken, however, in supposing they had killed the deer, for on rounding a point a few minutes later we noticed, at the distance of about fourteen hundred yards (being a thousand feet above sea-level the air is rarefied and clear, therefore objects appear closer than they really are), a dark-grey animal come out from among the trees and move along the edge of the lake. Almost immediately it was followed by another and another, until fourteen of what subsequently proved to be wolves were moving round the lake in single file. For years, in all parts of Canada and the Western States, I had heard wolves howl and give tongue; but here was the first pack I had ever seen in plain view. For fully two minutes we crouched behind the snow-covered rocks on the point and watched them. Between us and them was a deep, wide bay, so that there was no way of getting to them without being seen. The range was too far to make accurate shooting, and the intense cold gave us notice to move on. What should we do? This speculative policy was agreed to and acted on. Advancing towards them across the bay, they took no notice of us for the first hundred yards. Then they suddenly bunched together, sat up on their haunches, and watched us intently. Wondering what they would do, we continued our advance. Would they really attack us—as all kinds of backwoods literature, white men, and Indians said they would—or seek cover? In less than thirty seconds our doubts on that point were set at rest. Six of the bunched-up animals got off their haunches and, springing clear of the rest, headed straight towards us. The others quickly tailed on behind, and down they came in long, low, steady jumps that carried them over the level ice with a speed and swiftness I had not credited them with possessing. As they approached they spread out like a lady’s fan, so as to outflank and encircle us. This, though distinctly disconcerting, was nothing compared with the deadly silence they maintained throughout, and which unnerved us much more than their sudden attack had done. 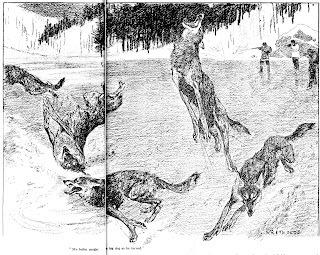 Every moment we expected they would burst into merry music, as they had been doing only a short twenty minutes before among the timbered ridges; but evidently wolves, when in sight of their prey, run it down in perfect silence. Such a course would certainly have relieved our nervous tension. As it was, all the blood-curdling stories. I had ever read or heard about wolves flashed through my mind. But did they know we were men, or had they mistaken our three indistinct figures, so far away, for deer? Seconds would now decide the question. Down went our small packs, snow-shoes were kicked off, and cartridge-belts pulled round to be handy for instant use. Glancing up, I noticed that they had covered half the distance, though hardly a minute had elapsed since they had started—a good twelve hundred yards away. At five hundred yards or so we could not only see how swiftly and smoothly, with a hardly-perceptible up-and-down motion, they could get over level ice or ground, but also their mode of surrounding and pulling down their prey. For they were bearing down like the Spanish Armada, in the shape of a half-moon, the two outer points of which were three hundred feet apart, and widening as they came. One, with its hind leg broken, got up again and limped after the rest, but a second bullet put it out of pain. The remainder, with heads well down, to escape the showers of frozen snow and ice that the high-power bullets ripped up and sent over them at five, six, and seven hundred yards, sped back with the same long, low, smooth bounds that quickly carried them to the edge of the woods, into which they disappeared. Curiously enough, even when badly wounded they never once uttered a sound. Whether they charged down at us as human beings or deer is a problem difficult to solve. Taking into consideration, however, their wheeling round so quickly, with an unmistakably crestfallen air, and before a shot was fired, and the fact that we were carrying small packs strapped to our backs and wearing whitish-grey Eskimo hunting-shirts, and were also forcing our way with bent bodies against a sharp wind driving a slight flurry of snow, I incline to the latter belief; otherwise they would have charged home. Built for strength and speed, this strong pack—above the average in numbers— could have torn the three of us to pieces in as many seconds. Therefore I maintain—and I have no reason to change my opinion either from former experience or since—that, for once, a pack of wolves had really charged three men in mistake for deer. It mattered not which cabin we occupied, we were at some part of the night “serenaded” by long, dismal howls of one or more wolves. And let me say here that a wolves’ “concert” held at night in the dark, gloomy pine-forests of Canada is the most spirit-depressing music ever listened to. Even when shut up securely in a cabin, it sends a cold shiver of some impending calamity through the frame of the stoutest man. One night, about ten o’clock, at No. 2 camp, a longer and more dismal howl than usual broke the quiet stillness of the surrounding woods, lit up by countless thousands of sparkling stars and a bright moon, nearly at the full. The howl came from the point of a penin­sula nearly a mile distant across the lake. Instantly from a ridge behind and to one side of the cabin, came a short, sharp answering howl. The echoes had barely died away when from the same quarter of the ridge the main pack broke into a chorus of “yi-ki-hies” that sounded like a volley of rifle-shots. Then down they came past the cabin and out on to the lake. Opening the cabin-door let in a volume of yelps so deafening that for the moment we thought the cabin was full of tongue-giving wolves. But, looking across towards the peninsula, we could see about a dozen swiftly-moving black dots out on the ice, which lay shimmering like molten silver under the bright, frosty moon, the “yi-ki-hies” becoming fainter and fainter after they had passed under the shadows cast by the tall conifers on the peninsula, finally dying away completely. 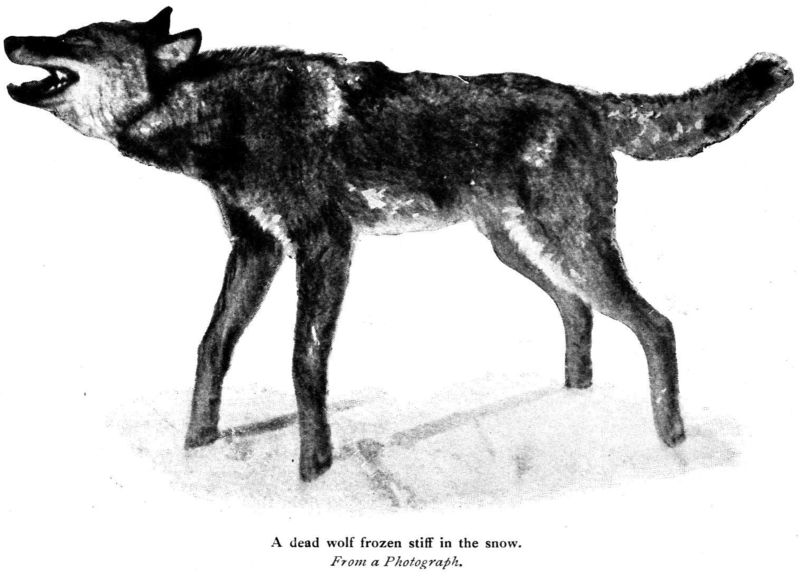 That the long, dismal howl of the lone wolf had carried a message—even if unintelligible to man—to the main pack there could be no doubt, and to this the clean-picked skeleton of a deer, found on the far side of the peninsula the next morning by following their trail, clearly testified. And this trail, after it entered the woods, proved to be very interesting from the fact that it showed only too plainly that the instinct of these wild hounds in knowing how to outmanoeuvre, surround, and pull down their prey is infinitely superior to that of the trained hound. 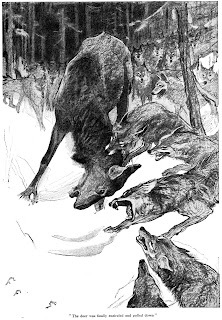 Although, as I have tried to point out, wolves are possessed of wonderful speed, they depend more on their brains than their legs, for while part of the pack had stopped behind to drive the deer forward, the rest had outflanked it to right and left, forcing it to go in the direction wanted, when the deer was finally encircled and pulled down. I venture to say from experience that no pack of domestic hounds ever bred and trained by man can run down their quarry as quickly and intelligently as do these wild hounds from their own natural instinct. Before I had-time to explain that it came from the great Northern lynx (Felis canadensis), its mate answered from somewhere near by the cabin, which brought us sharply to our feet. I was just in the act of lighting a match when again came the shrill scream, answered, not by its mate, but by wolves, singly, in pairs, and all together, from several parts of the lake. “Merciful powers!” exclaimed one of my companions, nervously. 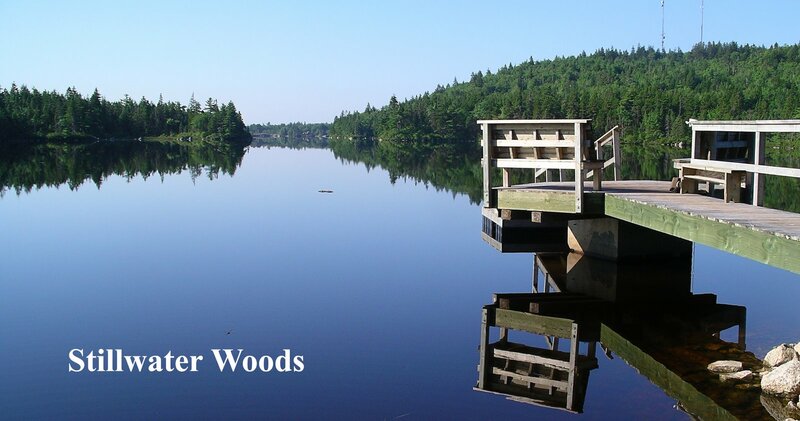 “I’d rather be out on the lake than shut up in here listening to such weird, mournful brutes. It makes one think of death and the grave” —which explains the feeling created better than the writer can. As trying to sleep was out of the question, I suggested dressing again and walking across to the peninsula to see if they had more courage to attack us at night than they had in daylight. Being very still, freezing hard, and bright as day, one could see to shoot perfectly. We had not advanced very far out on the ice when every howl ceased. That all the keen-eyed brutes saw us, however, was quickly made apparent, for presently a sharp “wouff-wouff” came from an unseen brute on a point slightly behind and to one side of us. Then another, in the same key, from the peninsula, followed by others, until one grand chorus swelled up from the weird orchestra. It was very tantalizing, certainly. Complete silence followed the rifle-shots, however, and we slept peacefully until late in the morning. A few days afterwards my two companions left for home, and three fresh hunters arrived in their place. Then what I had been waiting for set in—a January thaw! I could now make a blood-trail, and see if wolves would follow it, as if they did the problem of how to get them within accurate rifle-range was solved. The blood of a dozen wood-hares (locally, rabbits) made a trail about two thousand yards in length, running past two points jutting well out and across the bay fronting on No. 2 cabin, and finishing at a point some three hundred yards away, in plain sight from the door. Two mornings later, the weather keeping soft and our taint having gone from along the trail, we were awakened from a sound sleep by what sounded at first like a band of music, but which turned out a moment later, when we were fully awake, to be a troop of ten wolves giving tongue. Rushing to the little window and looking out we could see them as they swept across the bay on the blood-trail, in extended order. Being well within range, we managed to get in a dozen or so shots before they rounded the nearest point. But this was because one of us ran down to the edge of the ice and whistled sharply. Thereupon the whole band stopped for a moment to investigate the unusual sound. That investigation cost them two of their number, and started the rest off at full speed for the nearest cover. Before they reached it, however, a third dropped, rolled over, got up, and then lay down for good. Subsequently several more were shot on other blood-trails; but further details would only be a repetition of the foregoing. 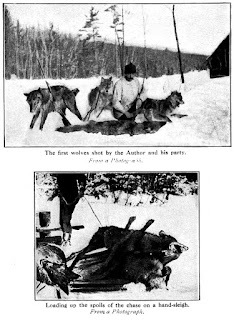 Measuring and weighing the wolves secured—the animals are shown in the photographs— they were found to average eighty-seven pounds in weight, six feet from nose to tip of tail, and to stand twenty-eight inches at the shoulder; which is a fair average size and weight for the timber-wolf found throughout Canada.